1. Start from Exit No. 3 and walk the along Gojo Street for about 100 meters. 2. Turn right at the corner of SEVEN-ELEVEN (shop). 3. Go straight for about 100 meters, the Jiyu-jin is on your left side. 1. Start from Exit No. 5 and proceed north for about 20 meters. 2. Turn right at the first corner which is alley. 3. Walk to the end of alley. The Jiyu-jin is in diagonally forward (left side). 1. Proceed south from the bus stop. 2. Turn left at the first traffic light (Kagiyamachi Street). 1. Start from Exit No. 1 and cross the Kamogawa River, and proceed west on Gojo Street for about 10 minutes. 2. Turn left at the intersection where SEVEN-ELEVEN (shop) is located. 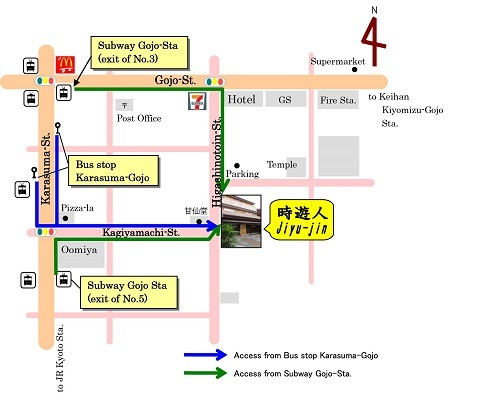 Take subway Karasuma Line bound for Kokusaikaikan, and get off at the next stop Gojo(五条) Station. It is about 3-minute walk from Exit No. 5 or No. 3. 1. 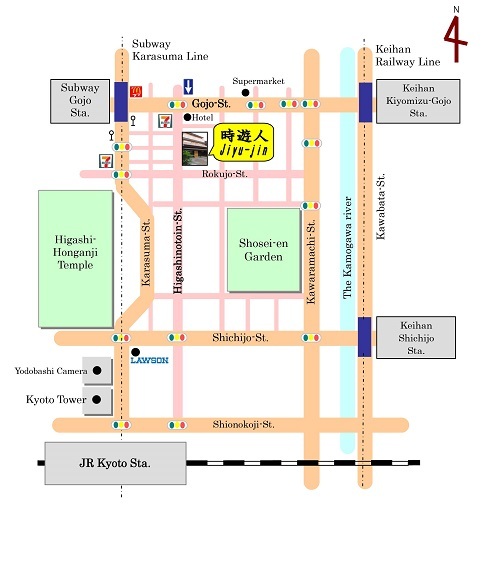 Go straight north along the Karasuma Street from the Kyoto Station (Side of Central Entrance and Kyoto Tower). ※On the way, you will see the Higashi-Hongannji (a big temple) on your left side. 2. Walk north along the Karasuma Street for 15 minutes, you will find the subway station Exit No. 5 (Gojo Station) which is next to the Japanese lunch box vendor (shop). 3. Then, turn right at the first corner which is alley. ※ Please do not pass by Pizzala (Pizza delivery shop). 4. Walk to the end of alley. The Jiyu-jin is in diagonally forward (left side). 1. Take a city bus No. 5, 26 or 101 at the Kyoto Station Karasuma Exit (north side of station) and get off at Karasuma Gojo(烏丸五条). 2. It is about 3-minute walk from the bus stop. 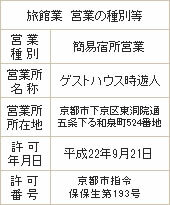 Copyright © 時遊人. All Rights Reserved.